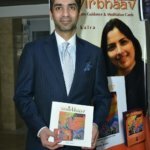 Annu Kalra ji’s book has been a great learning and education for me. The creative approach to the whole process with illustrated cards makes the whole process very dynamic . Exactly the approach needed to navigate life’s challenges in an inspiring way. Annu is not only a spiritual mentor and life coach, she is a great motivator for the individuals and the teams . I really like the way she takes examples from our rich spiritual texts and relates them to the common life situations and imparts key lessons in a simplistic manner . 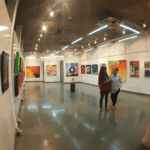 The bright colours in her paintings mirror the clarity and brightness she helps people to achieve , through her interaction with them on their life situations . Though being completely non spiritual and an agnostic by temperament, I have seen Annu live her life by her belief in a power beyond apparent human comprehension yet immensely potent. Well, if there is such a power, Annu's life is a living testament of that. 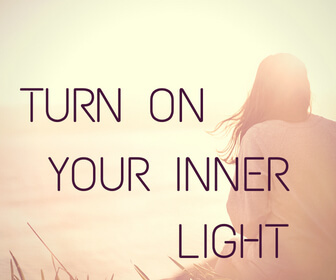 I'm sure there are many others who will find through her immense energy a path for themselves. A path, that could take them to peace and harmonised living in this increasingly chaotic world. A path that Annu has blazed herself, and is now ready to share with others. Beyond the obvious, within the Cosmic reside alleys and pathways that rarely reach those who may most need it. When they do, as in this Integrated Analytical and correctional tool that Annu Kalra has co-created (with the Greater Cosmic Force) be sure to grab and practice it. There are moments you will reach out for it. Even better make a habit of it. Conspire with the Divine and reach ever higher. I have known Annu to be a good at many things.A profound thinker, with deep understanding of rituals and spiritual practices. She is at once creative and pragmatic; Vivacious and intense... Endowed with a lovely voice and skill to match, she mesmerises audiences when she sings. 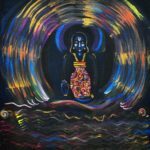 She paints what see channels through meditation, making each art piece completely unique. 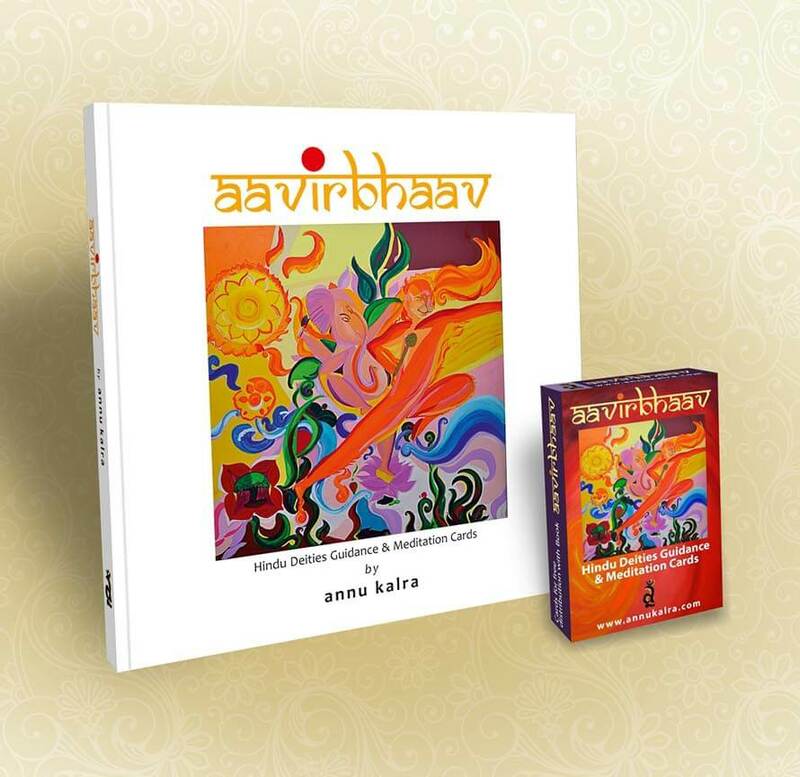 Aavirbhaav—Hindu Deites Guidance and Meditation Cards by Annu KALRA couldn’t have come at a better time in my life. As a cricketer I lead a hectic and sometimes ‘unreal’ life. Besides family, others I meet seem to be way too nice and dare I say artificial at times. This book has helped me navigate through some of the landmines that a cricketer’s life may entail. With this book’s assistance I am now learning to seek spiritual rationale in aspects of life. For me this book is a must have for any urban citizen. As a Counselor Annu helped me out of a situation, as a friend and Guide she took me through some awesome experiences at the Kumbh, with her loving and caring she got me much needed help at a most sensitive time. With her inspiration and courage she assists others to discover themselves. Full of grit & joy & hope I know we are always connected even though we may not meet often. 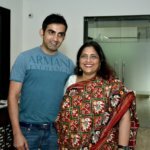 I feel fortunate to have interacted with Ms. Annu Kalra over many enchanting sessions delving into roller coaster events of my life. 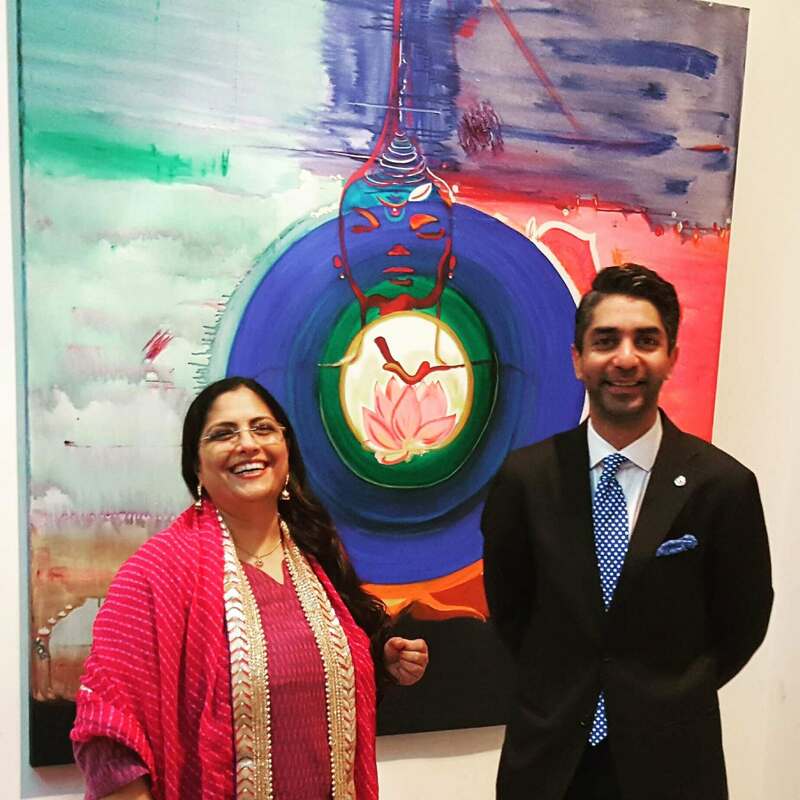 An articulate, sensitive and caring person Annu ignites hope and optimism. Best Wishes !!! Annu Kalra is very talented. Whenever I meet her I feel an aura of positivity around me. 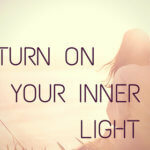 Her meditation sessions are very refreshing and the energy can be felt, not described. 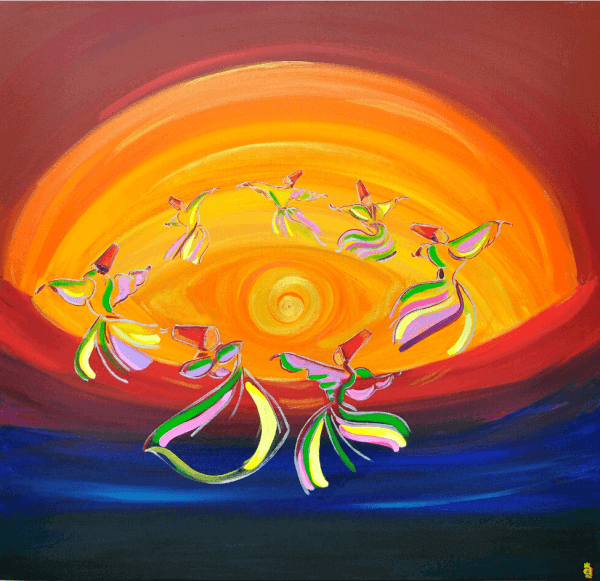 The same level of high spiritual energy is reflected in her paintings and writings. All the best Annu ? 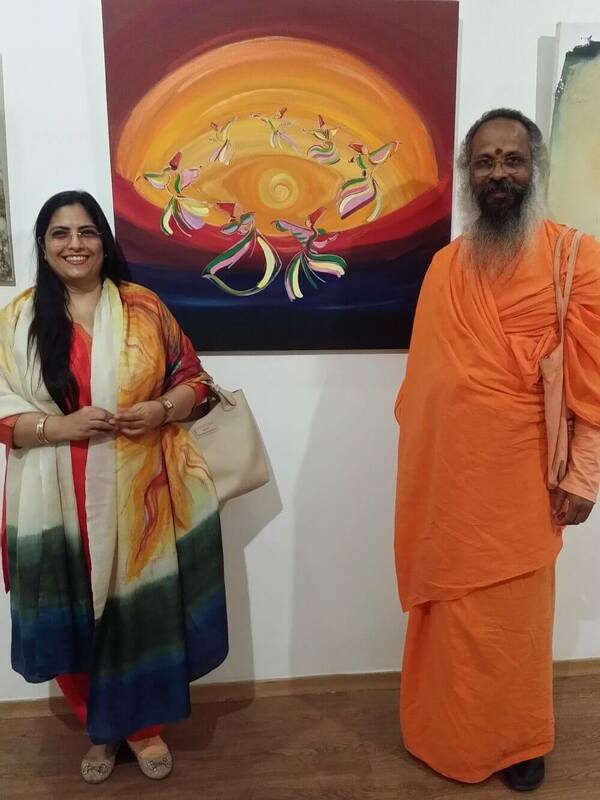 In a serendipitous moment, I agreed to visit an exhibition of Annu Kalra's paintings, and found myself totally charmed by both the artist and her works! The paintings resonated with me at a very deep level, visually reflecting many of the mystic concepts I have explored in my own Kaal Trilogy. Even though we were meeting for the first time, the comfort level was immediate. I look forward to seeing more of her work, collaborating with her in some way at some stage - and maybe having one of her evocative paintings in my home some day! Though there will be many who would have been touched by annu's sensitivity and guidance from time to time, I have been lucky in having her constant counsel and unwavering support in addressing my day to day life decisions as a single parent. I have always admired her special knack of seeing through a situation objectively and showing me the mirror from time to time...the exact moment when these interactions led me to a path of self discovery still eludes me but the last decade of her mentorship has gradually, tenderly, painstakingly unveiled a joyous, beautiful and a much more at peace individual. Annu is a truly gifted person! She is a compassionately out of the box personality who spreads goodness & positivity. She is healer by nature. And may she gain more such spiritual prowess & bloom.